Guernsey has had several distinct flags over the centuries. The present one isn’t as old as you might imagine, having only been adopted in 1985. Guernsey’s official flag is a St George’s Cross overlaid by a gold Norman cross. The combination nods at the island’s connections to both England (latterly Britain) and Normandy. The Norman cross was the symbol of William the Conqueror, and the Guernsey flag is therefore flown in commemoration of the Battle of Hastings. It was adopted on 30 April 1985 and replaced the Union Flag as the pennant flown on Grosse Rocque throughout the year. Guernsey previously used simply the St George’s Cross, but this led to confusion, particularly at sporting events, when some may have thought it was being flown by an English team, rather than Guernsey. A proposal to overlay it with the Guernsey coat of arms was discounted as this would have introduced a level of detail that would have been difficult to discern at a distance. Guernsey went for some time without an official flag, but there is evidence of an earlier, 19th century design being used. This showed the St George’s Cross on a chequered field, with the Union Flag in the upper left quarter. There is some debate over whether the chequered field should be blue and white or black and white. Guernsey also has its own civil and merchant ensigns, which are flown on boats. The civil ensign shows the Union Flag in the upper left corner, on a red field, with the Norman cross to the right. The merchant ensign has a blue field, rather than red, but is otherwise identical to its civil counterpart. 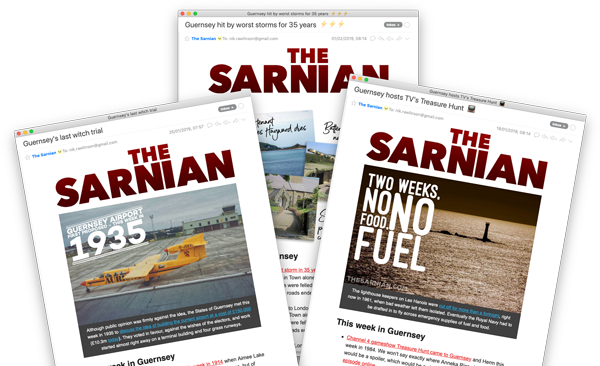 Guernsey flag appears in The Sarnian, the explosive adventure series in which the discovery of a dead body on one of Guernsey's most secluded beaches blows the lid on a world of intrigue and deceit. The current flag, which was adopted in 1985, was the result of several years’ deliberation. It was granted a Royal Warrant, making it ‘official’ in February 1985, and flown for the first time on Liberation Day – 9 May – that same year. An unofficial sporting flag also exists, bearing the Guernsey coat of arms in a vertical white panel between two vertical green panels. Each panel occupies one third of the width of the flag. Green is the colour of Guernsey’s football team when playing in the Muratti cup.